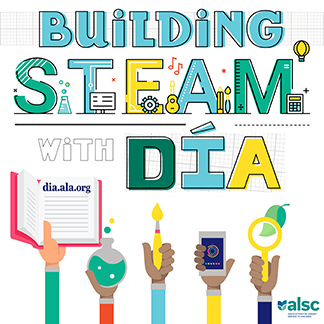 Are you looking for a fun way to combine art and literacy into programming at your library? One great way is to start a recurring weekend art program! We came up with the name Saturday Morning Art- SMArt for short. Other cute names could be Little Artists or Art Explorers. 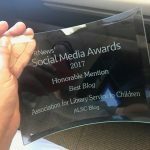 Our program is geared towards patrons in kindergarten through second grade and is typically offered once a month, but you could easily adapt the program for tweens. Here at Rocky River I’m lucky enough to work with a former art teacher, Ms. Heather, who has amazing insight into teaching art concepts to elementary aged students. 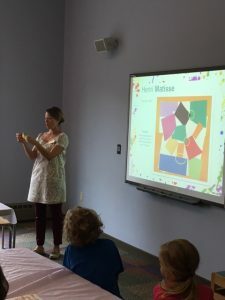 As a former painting major in college and art lover I was really excited to start a program that could mesh together her invaluable art education background and my librarian education! Together we crafted a program that combines our collective love of art and books. SMArt has been very popular at my library since we began hosting this program close to a year ago and we plan to continue offering new programs for years to come. I imagine this would be popular at many other libraries as well. If you are interested in starting your own weekend art program, but are intimidated, don’t be! You don’t need any real artistic talent to lead this program and there are an amazing amount of resources online for project inspiration. 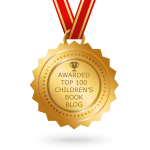 Some of my favorite kid art websites and blogs are listed at the bottom of this post. The kids really need you there for direction and support in the program, so don’t feel pressured to become a bonafide artist. Ms. Heather discussing Matisse’s work. Image provided by Nicole Martin. So you’ve overcome your fear of hosting an art program – now you will want to plan! The most important part of the program is choosing a focus artist, illustrator, and/or art concept. Once you have that narrowed down, it is easy to build your lesson from there. We always share a picture book that coordinates with our focus concept or artist, and luckily there is no shortage of quality picture books available to choose from. For example, this winter we held a SMArt program with Henri Matisse as the focus artist. Our focus book was The Iridescence of Birds: A Book About Henri Matisse by Patricia MacLachlan. Other great focus books you could use include titles such as My Name is Georgia: A Portrait by Jeanette Winter or Caldecott winner Radiant Child: The Story of Young Artist Jean-Michel Basquiat by Javaka Steptoe. After you have picked your artist and book, you’ll want to put together a presentation! Some points to hit on include the artist’s life, artwork, and sharing some basic steps for how the kids will create their own masterpieces. We usually like to include blown up images of some of the book illustrations too. Our program is an hour, and you will want to leave at least 35 minutes for creation. 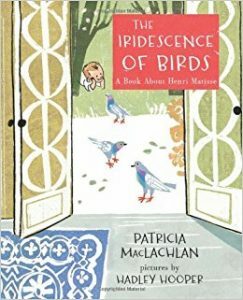 Ideally, you will spend 15 minutes or so with your read-aloud and discussion of the artist and art project. Of course, leave some extra time at the end for the kids to walk around, see each other’s art work, and show off their art to their parents! 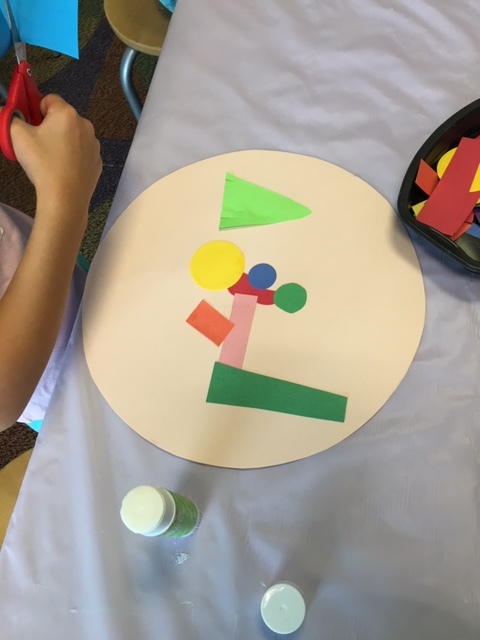 Matisse inspired art! Image provided by Nicole Martin. As far as the art project itself, try to pick something that will be easily accomplished by this age group in the time given and ideally something that they will be able to take home with them the day of the program. Some of our favorite websites for art project inspiration include Deep Space Sparkle , the Cassie Stephens blog, and Artsy Craftsy Mom. One final tip for this program- be sure to ask participants to wear an art smock or oversized t-shirt to the program! Art can get messy and you want to send your little artists home not completely covered in paints. 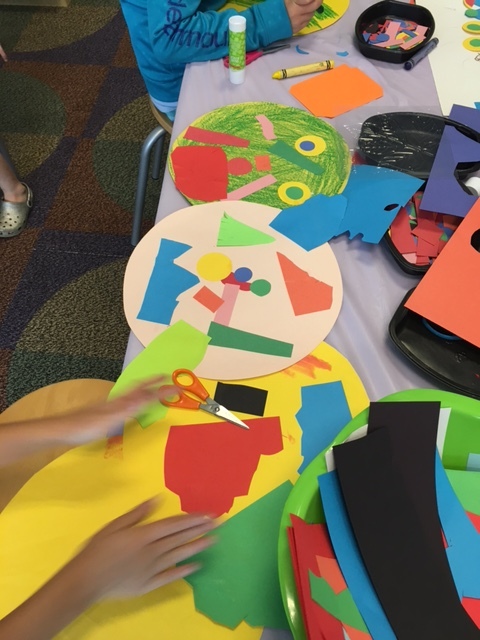 Do you do an art program for elementary kiddos at your library? I would love for you to share some of your projects in the comments below! School Age Summer Program Inspos! Love this — always eager to try new ideas! I am going to be starting a weekly after school program in the fall called “S.T.E.A.M. Storytime Surprise” and plan to do at least one artist-based program each month (along with science, engineering, math and story/craft programs). I will be using many of the programs from a K-4 art series that I had done at my library in the past — plans on my blog: http://carolsimonlevin.blogspot.com/search/label/Picture%20This (each includes picture books and other resources). Incidentally, the program title came from the excellent “Art Explorers” series of five books by Joyce Raimondo: “Picture this! : activities and adventures in Impressionism” “Express yourself! : activities and adventures in expressionism” “What’s the big idea? : activities and adventures in abstract art” “Imagine that! : activities and adventures in Surrealism” and “Make it pop! : activities and adventures in Pop art.” Each includes brief background info for 6-8 artists, suggestions to help your kids really look at the art, plus ideas for related art projects for kids in various media.